Deodatus became a clockmaker on his own in Newcastle in 1680 at the age of 23. He was the oldest of five sons. His father, a chaplain to the Earl of Carlisle, had died three years earlier. His French mother, Thomasine, moved to Newcastle from Brancepeth after her husband’s death, probably to be closer to Deodatus. Clockmaking had taken a giant leap forward in technology in 1656 when a Dutch scientist, Christiaan Huygens, invented the pendulum clock in the Netherlands. The new clock reduced the loss of time from fifteen (15) minutes per day to just fifteen seconds. clocks that go exact and keep equaller time than any now made without this regulator (examined and proved before his Highness the Lord Protector by such doctors, whose knowledge and learning is without exception) and are not subject to alter by change of weather, as others are, and may be made to go a week, a month, or a year with once winding up, as well as those that are wound up every day, and keep time as well, and is very excellent for all House Clocks that go either with springs or weights; and also Steeple Clocks that are most subject to differ by change of weather. Made by Ahasuerus Fromanteel, who made the first that were in England. You may have them at his house on the Bankside, in Mosses Alley, Southwark and at the sign of the Mermaid, in Lothbury, near Bartholomew Lane end, London. As a teenager, Deodatus had apprenticed at the Fromanteels’ shop in Newcastle. This positioned him for a lucrative career producing the cutting-edge clock technology for a demanding English market. Hannah Anderson became Deodatus’s first wife. Her parents, William and Margaret, had acquired land in Newburn by lease from the Earl of Northumberland. Deodatus and Hannah were married on December 11, 1684, and their first son was born the following year. They named their son, William. Both Deodatus and Hannah’s fathers were named William. In 1687, their second son, Deodatus (II), was born and christened at All Saints’ Church in Newcastle. As an adult, this son would emigrate to Virginia in the New World, by way of Bermuda, taking his line of the family to America. Two daughters were born to Deodatus and Hannah between 1689 and 1692. They named the girls Hannah and Mary. Church records show that baby Hannah’s French grandmother, Thomasine, stood as godmother at the child’s christening in Newcastle. A decade after striking out on his own, Deodatus was a reputable and successful clockmaker. 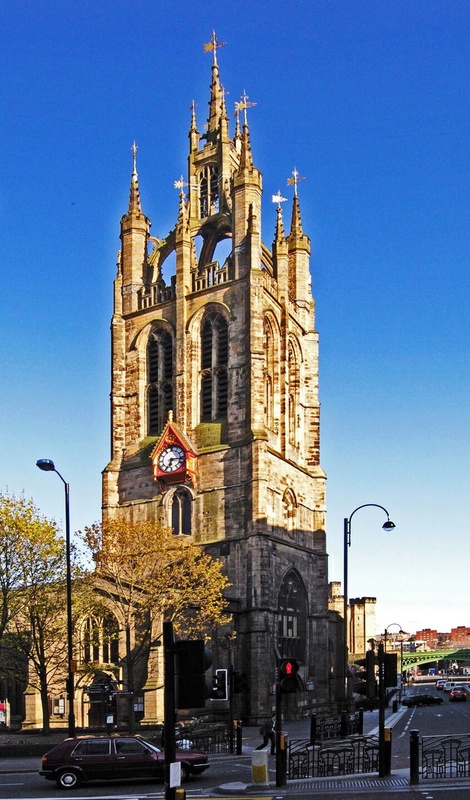 As a result of his professional standing, he was commissioned in 1691 to make a new clock for the steeple of the church of All Saints’ at Newcastle. This must have been a highly prestigious assignment for Deodatus. The churchwarden’s accounts show that Deodatus not only made the steeple clock, but was hired to keep the clock in running order at a salary of fifty shillings. Deodatus was still drawing the salary from All Saints’ Church in 1703, when he was paid an additional amount for making the clock strike. Hannah gave birth to another daughter in 1695. They named her Ann. Also in 1695, the lease on the land in Newburn that had belonged to Hannah’s parents was renewed in favor of Deodatus Threlkeld for an additional 21 years. Deodatus and Hannah’s last child, a son named Joseph, was born in late 1697. This child may have died at birth or shortly after. Sadly, Deodatus’s wife, Hannah, died early in 1698, perhaps as a result of the birth. She and Deodatus had been married for fourteen years. Hannah had given birth to six children during her lifetime. When the lease on the Newburn land came up for renewal, it reverted to Hannah’s sister, Tabitha, and Tabitha’s husband, William Softley. The original All Saints’ Church in Newcastle no longer exists. It was pulled down at the end of the 18th century and replaced with a new church. St. Nicholas, another Gothic church of the time stands nearby and has survived to the present day. Noma Bruton is a banker and amateur historian. She is the eighth great-granddaughter of Deodatus Threlkeld I.
Hi , James that is wonderful . I’m an American living in the U.K. my grand mother was Virgie Eunus Threadgill . I’m 10 generations from Deodatus. I have visited Bermuda and the Threakeld home in the U.K. several times. I would love to hear from you.